Enriched with our immense knowledge and expertise in the field, we are involved in offering Pre Filter. These filters are used for capturing the large particles before their entry in the main high-efficiency particulate air filter, which enhances the life of the main filter. The product is made using high-grade raw material procured from reliable vendors and utilizing advanced technology. These are available in different sizes to meet the requirements of the clients. 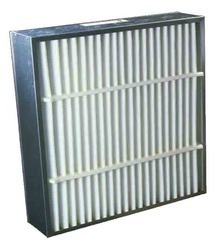 Moreover, our valued customers can avail this filter from us at an affordable price. Looking for Pre Filter ?